Beautifully engraved certificate from the Rawhide Mining Company issued in 1911 or earlier. 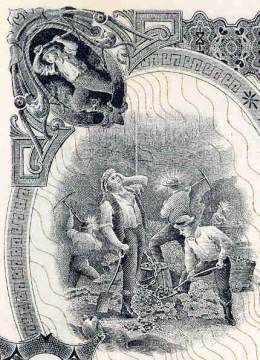 This historic document has an ornate border around it with a vignette of men working in a mine and the company name in fancy script. This item is hand signed by the Company’s President ( A. A. Codd ) and Secretary ( A. M. Coote ) and is over 107 years old. A. A. Codd was moved to Goldfield in 1904 and became Chief Deputy Recorder in 1904 and 1905 at a time when Goldfield was seeing registrations of seventy-five claims per day. Codd amassed great wealth he lost as much as he made in stock and land speculations. Located in Rawhide District, Nevada. About 20 acres in process of patenting. Gold. 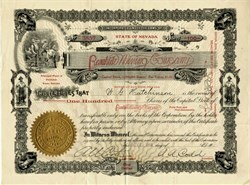 Incorporated 1908, Nevada laws; capitalized at $1,000,000—1,000,000 shares, par $1. Non-assessable. 200,000 shares in treasury. Officers: A. A. Codd, President and Manager; J. H. Barrett, Vice-President; A. W. Coote, Secretary and Treasurer, and W. H. Buck, Manager of Mine. Main office, Nixon Bldg., Goldfield, Nevada.